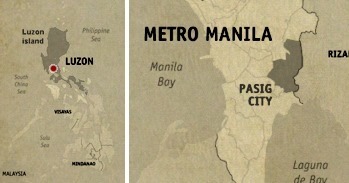 METRO MANILA | Pancit Center, Take Two! Just a few weeks after our epic first pancit tasting at Pasig Kapitolyo’s Pancit Center, we were at it again. With a bigger group this time, we ordered more pancit varieties. We chose mostly those that we’re unfamiliar and those that we haven’t tried yet, but we also re-ordered some familiar ones and the previous session’s favorite. It was a Saturday and the place was packed to the rafters, we waited a bit to be seated. I guess the metro people are starting to take note of this one of a kind panciteria. 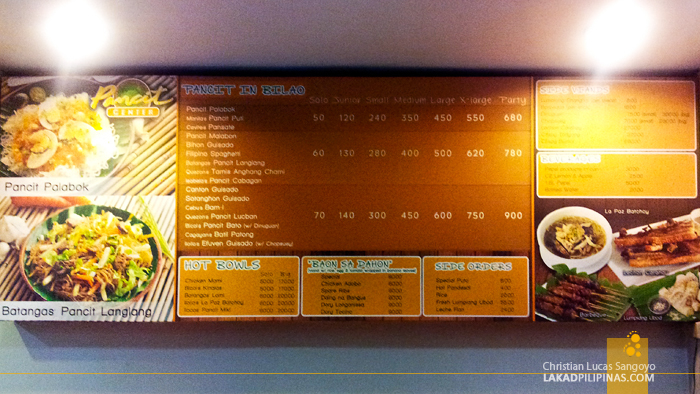 I also noticed that they’ve added two new dishes to their rosters of pancits; Bataan’s Spabok and Bulacan’s Pancit Marilao. 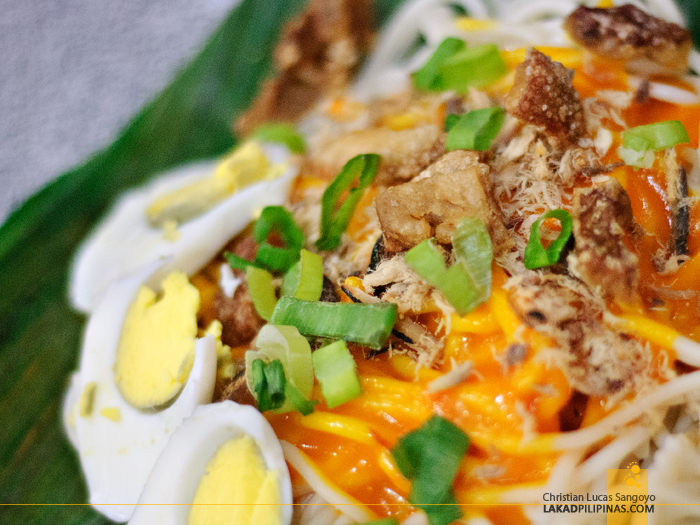 Enticed by their new offerings, we ordered Bataan’s Spabok. 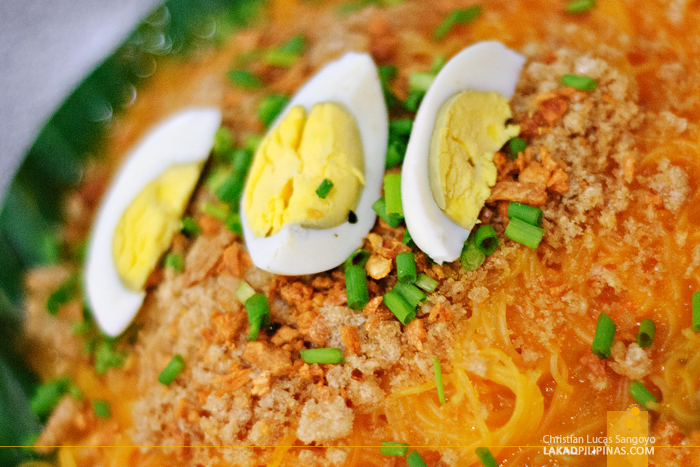 And as its name suggests, it’s a combination of the traditional Palabok, but with spaghetti pasta. We weren’t that impressed at first glance since the serving size was quite petite. We were six in the group and we were only able to have two spoonfuls each. The verdict, everyone agreed that it was nothing to write home about. It’s basically just what its names suggest. We immediately cleared the table and picked our second pancit. 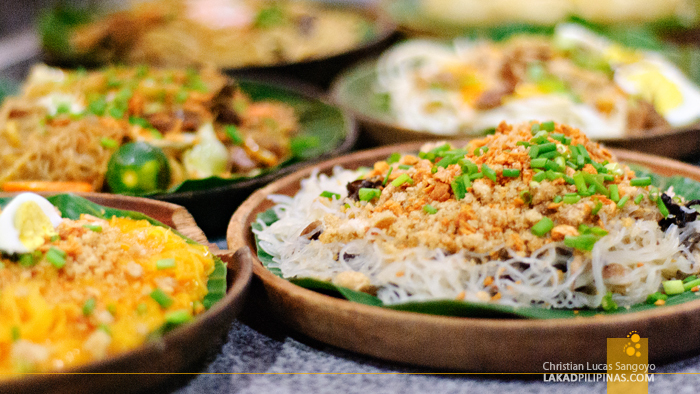 Batangas’ Pancit Langlang is a combination of egg and thin rice noodles mixed with crispy veggies, pork, garlic and spring onions. I’m really not a fan of these kinds of pancit but I still forked in a few mouthfuls just to check how it fares. To my surprise, it was really good! It tasted like your traditional pancit, only more flavorful. The presence of the veggies gave the dish a crunch that really went well with the noodles. Big thumbs up from everyone. 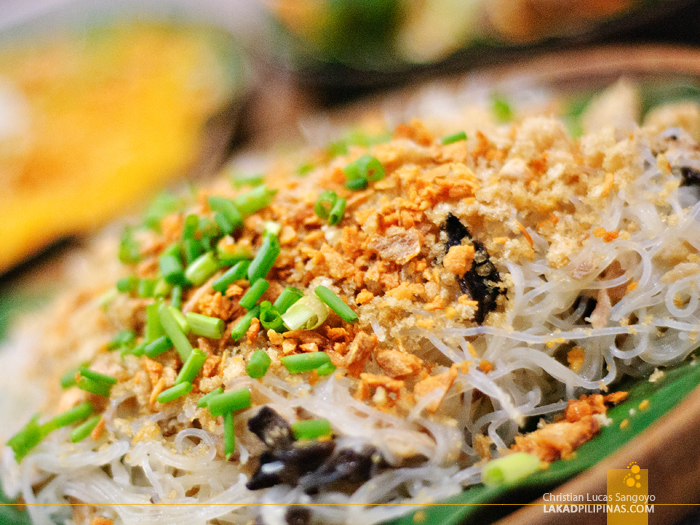 Next up was Manila’s Pancit Puti; we’ve been curious about this pancit since our first outing at Pancit Center. 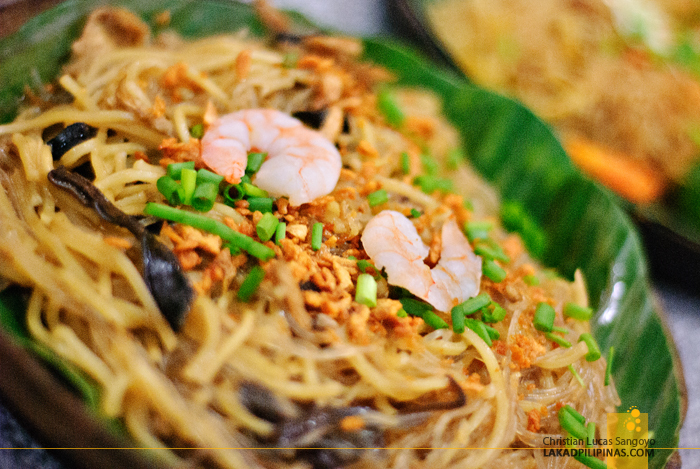 Everyone’s of course been to Manila and we’re clueless where in the city it originated from as we haven’t seen this kind of pancit in Manila’s streets. Ever. As its monicker suggests, it’s mainly made up of thin white noodles spruced with lots of garlic, spring onions and a few mushrooms. It doesn’t look that much, but I loved it at first bite. 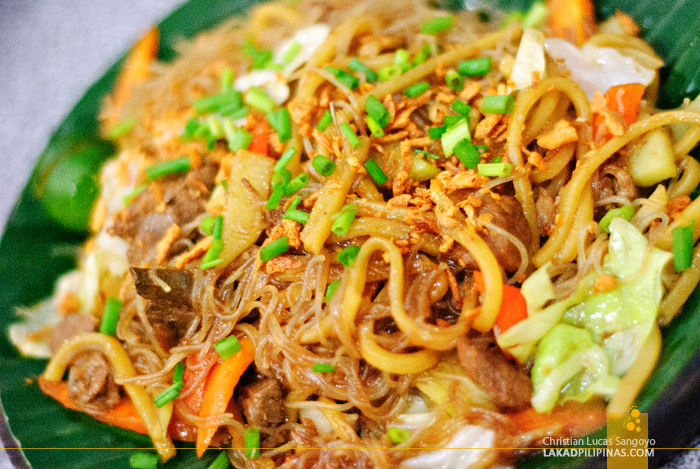 I love garlicky food and this pancit is overloaded with garlic! Two of us absolutely loved it, three were okay with it and one utterly abhorred it. Since we absolutely loved Pancit Center’s version of Lucena’s Tamis Anghang Chami from our previous taste test, we again ordered a plate for the new guys in the group. We were a bit puzzled when it arrived on our table as it absolutely didn’t look like what we ordered before. It has the same thick egg noodles but it was too saucy and the onions were cut differently. Hmmm… We each forked a mouthful before half of the group exclaimed that it didn’t taste the same. We actually wouldn’t mind if it tasted better but it seemed much too flavorful now for its own good. We prefer the old version of their Chami. Everyone agreed that it’s too strong-flavored and gave six nayes. Cebu’s Bam-i was next on our plate. Made up of Chinese and thin glass noodles, it’s topped with shrimps (only two pieces), chicken bits, garlic, scallions and mushrooms. It looked like your regular pancit dish until you taste it. The flavor is very strong, almost viand-like, that a few of us suggested that it might be better with a cup of rice on the sides. The verdict; ten thumb downs. Only one of us actually liked it. We saved the most colorful pancit for last, Pancit Palabok. 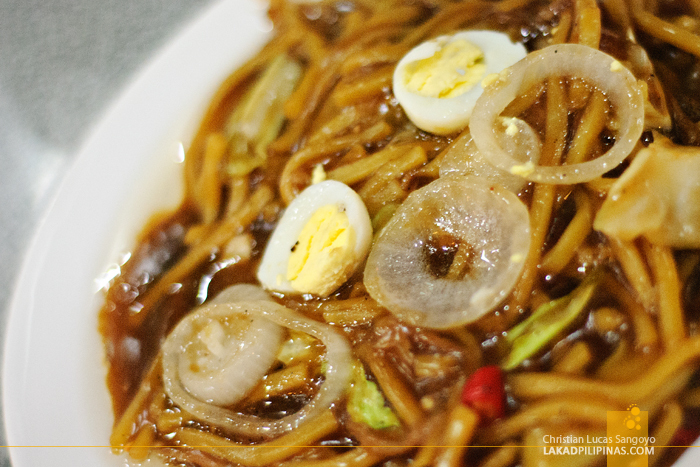 Everyone’s probably tried this noodle dish even just once in their lives but we were curious how Pancit Center’s version fares with all the numerous ones out there. Topped with eggs, crushed chicarons and spring onions; the thin noodles is heavily coated in Corrie's special orange sauce (don’t ask me who Corrie is please). As usual, everyone took their shares and waited for ten seconds of tasting before speaking. It was unanimous; we all find it to be average. Me thinks, Jollibee’s version is even better than this. Six pancit dishes, two bottles of 1.5 litters of softdrinks and a batch of putos cost the six of us Php87.00 each. Our tasting session had us traveling from Manila to Bataan to Batangas to Lucena and all the way to Cebu without leaving the Metro. Again, not a bad deal. 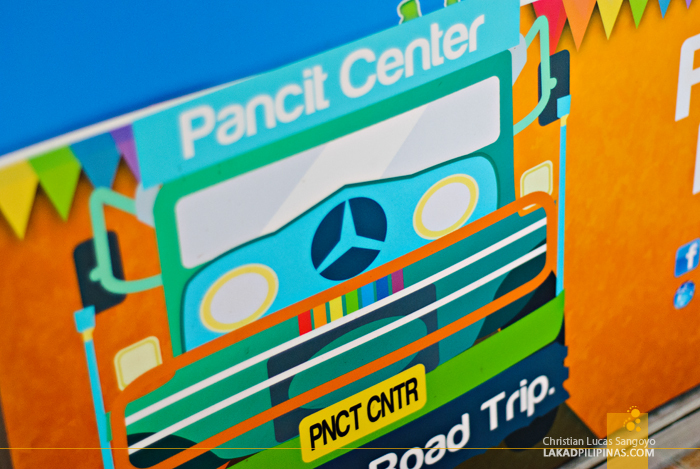 Ten regional pancits down, eight more to go! GPS Coordinates: 14° 34' 32.77", 121° 3' 32.62"
Nagustuhan ko kaya yung Bam-I! Diba nga I liked everything? Hahahaha. Grabe yung utterly abhored! Hahaha.